Courtney Love says she's "suicidal"
According to reports, Nirvana frontman Kurt Cobain's ashes have been stolen from the Hollywood home of his widow Courtney Love. A distraught Love describes herself as "suicidal." "I can't believe anyone would take Kurt's ashes from me," says Love. "I find it disgusting and right now I'm suicidal. If I don't get them back I don't know what I'll do." Love had kept the Cobain's ashes in a pink teddy-bear-shaped bag along with a lock of his hair. But a couple of weeks ago, she was horrified to discover them gone, along with thousands of dollars worth of clothes and jewelry. "If I don't get them back I don't know what I'll do," Love says of her husband's remains. "I used to take them everywhere with me just so I could feel Kurt was still with me. Now it feels like I have lost him all over again." 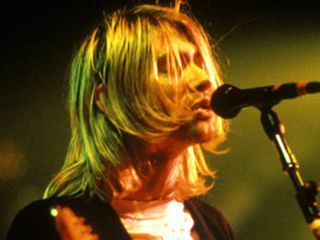 Kurt Cobain committed suicide 14 years ago at his Seattle home.